Stairs Pulling Away from Your Foundation? The front stoop or porch of your home is the welcoming point for visitors to your home and provides curb appeal for your home as well. It is also a very common problem to see cracks or see the stoop, stairs, or porch pulling away from the home. It is important to keep this place safe and keep the curb value of your home up. We can assist you with repairs to your stoop or porch. Reliable has years of experience that we can put to work for you. 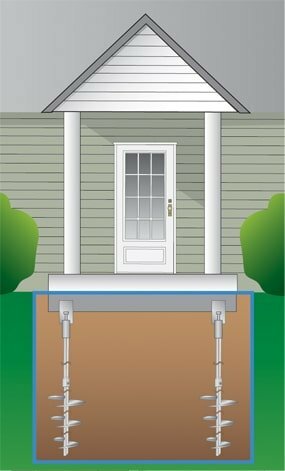 Helical piers are a great solution for your stoop or porch problem. We can use these piers to lift and position your porch or stoop back it it’s original place. Usually it only takes about 2 piers to accomplish this task. It is minimally intrusive to your landscaping and yard. If your porch or stoop requires masonry work or brick re-pointing we here at Reliable Waterproofing & Masonry can provide this service as well. We can fill the voids that may have been disturbed when the stoop or porch moved. This is very important to the aesthetics of your home. Your porch or stoop is somewhere you want to be able to sit and relax, and it is a welcoming place for your home when people come to visit. It’s important to make this an enjoyable place, but it is even more important to keep it safe for your family and those people that are visiting you. Contact Reliable Waterproofing and Masonry today for an appointment. We can make this a painless project for you and make your home safe for your family and friends. Call us today!